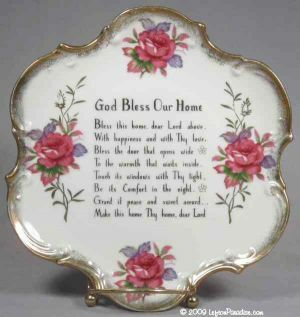 "God Bless Our Home" Wall Plate with Roses - 1073N Discounts Apply ! Lovely wall plaque with elegant roses and sponged gold embellishment. It has a beautiful scalloped edge and a lovely blessing sentiment. There is slight wear to the gold on the bottom edge. The plate is 8 inches in diameter, is marked 1073N and has a Lefton sticker.